Just because you can’t see the garbage, that doesn’t mean it isn’t there. We’re looking at you, Filipinos bathing in Manila Bay. 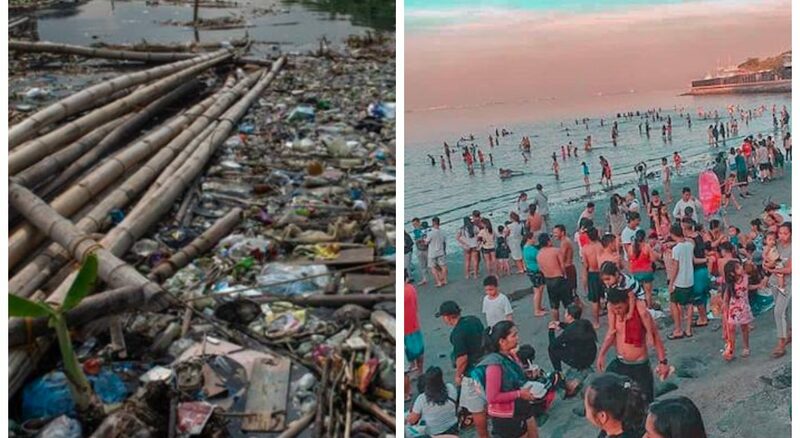 Manila Bay, which stretches along Roxas Boulevard in Metro Manila, Philippines had recently undergone a massive cleanup, larger than the usual ones it had every year. Thanks to the efforts of volunteers and government authorities, the trash that had accumulated on the popular body of water has been cleaned up, and it is now quite a sight. The surface was so clean that some Metro Manila residents may have thought that it was completely safe to to bathe in the bay! While the cleanup efforts happen yearly with regularity, this is the first time that the efforts have been highlighted in mainstream and social media. Thus, many volunteers arrived to help and the bay was clean once again. But without the continuous efforts to stop people from throwing trash near the area and all over the metro, the sea of garbage will no doubt be back the next year. Took a walk around Manila Bay. The place is crowded. Lots of people watches the Manila bay sunset. They're also watching the kids swimming in the bay, which is still dirty, unsafe and dangerous by the way. Here’s another shot, with even more people (especially kids) swimming in the dark waters. While the beach may look clean now thanks to the rehabilitation efforts, there is without a doubt a lot of bacteria, refuse and even feral matter left in the water. To get rid of the contaminants in the water, there needs to be special treatments done and more months of work before the waters are safe to bathe in. According to Philippine health officials, there is definitely more garbage waiting at the bottom of the water, and that the beach still has high levels of E. Coli. 300 meters from the shoreline, the waters are definitely still dark and are not safe, according to city officials. The Philippines’ Depratment of Health recently tested the waters in the bay, and found that the levels of E. coli. in the waters are 300 million times the accepted level of 100 mpn. Anyone who bathes or is exposed to such water through their skin, mouth, eyes, and other orifices are at risk for diarrhea, cholera, typhoid, dysentery, skin diseases and eye infection. Authorities have since warned the public to not bathe in the waters, and have cordoned off the area. Anyone who experiences the symptoms below could have contracted E. coli, and people who bathed in the bay should watch out for some symptoms in the next few days. These symptoms include severe stomach cramps, diarrhea (often bloody), and vomiting. If there is fever, it usually is not very high (less than 101˚F/less than 38.5˚C), according to the US Center for Disease Control.